Spring Fire, wrote Bax, is an attempt to describe ‘the first uprush and impulse of Spring in the woods’. An evocative and ‘freely-worked’ symphony in five movements, composed for large orchestra in 1913, it draws its inspiration from the first chorus in Swinburne’s pagan poem Atalanta in Calydon (1865). The music lends itself to a languorous approach though not at the expense of the momentum which drives the overall structure. The soundworld is characteristic of Bax in its blend of lush chromaticism, broad melodies and brilliant orchestral sonorities learned from the Russian nationalists as well as from Richard Strauss and Debussy. As the title of the opening movement In the forest before dawn suggests, Bax sets out to convey ‘the uncertain and pensive hour immediately before daybreak in the woodlands. It has been raining. The branches drip softly, and a damp delicate fragrance rises from the earth.’ Evoking primeval forests—a pagan world which had deep spiritual significance for Bax—shimmering horn and cello usher in daybreak while delicate flute, and later oboe, and flickering harp conjure the persistently falling droplets. Strings present a long-drawn melody with a melancholy lilt while instrumental colour is enriched by a rippling piano motif and a dance-like clarinet theme. With a crescendo and excited flute fanfares suggesting the rising of the sun, the second movement (really the second part of the introduction) leads straight into the exuberant Full day which lasts as long as the first two movements together. The score bears a quotation from Atalanta in Calydon: ‘Come with bows bent and emptying of quivers, Maiden most perfect, lady of light, With a noise of wind and May rivers, With a clamour of waters, and with might.’ This earthy, richly-textured movement includes a contrasting passage for four violins (marked teneramente or tenderly) with a melody which Bax later used in the opening of his piano piece Apple Blossom Time. The day passes, not without event, and gently leads, again without a break, into the spellbinding slow fourth tableau, Woodland love (subtitled Romance and described as ‘a nostalgic acquerella’). Played at half the tempo of Full day, it begins with a melody marked ‘romantic and glowing’ then ‘drowsily’. ‘For winter’s rains and ruins are over. And all the season of snows and sins, The days dividing lover and lover, The light that loses, the night that wins. … Blossom by blossom the spring begins,’ writes Swinburne. Here in Woodland love atmospheric instrumental solos include a solo violin, half-echoed by playful flute and a prominent, luscious clarinet solo as well as piquant oboe, while harps and piano add another layer to the texture. Woodland love dies away ‘in some strange harmony as though the forest-lovers had become drugged with their own ecstatic dream’ to the sound of woodwind, then trumpets and horns, weaving a pattern of subdued colour over low string chords and undulating harp arpeggios. This short orchestral piece is a fairly early work of Delius, which lay unplayed and unpublished for many years after his death. The autograph score was long in the possession of Sir Thomas Beecham and only became available for performance in the 1990s. Most of the orchestral works that Delius composed in his twenties were not performed in his lifetime. This was a difficult period for him, battling against parental opposition in his determination to become a composer. It was also a period of wandering, partly in the service of the family wool business, and partly in ventures of his own. He had visited Norway (where he made the friendship of Grieg) and Sweden; managed an orange grove in Florida (where he studied with a local music teacher); taught music at a college in Virginia; lived for a time in New York; and finally managed to study in Germany, at the Leipzig Conservatory. In 1888 Grieg had personally intervened with Delius’s father to allow him to pursue a composer’s career, and he had settled in France, where he would live for much of the rest of his life. It was there, either in his first residence at Ville d’Avray, or his second, in Croissy-sur-Seine, where he moved during 1889, that Idylle de printemps, which he subtitled a ‘Morceau symphonique’, was composed. Though it is an early work, Delius had already produced a substantial and effective orchestral score in his Florida Suite, composed in 1887 and performed in Leipzig (to an audience of just two!) during Delius’s last term there in 1888. He had also written several other orchestral pieces such as the Serenade for violin and orchestra, Sleigh Ride and Marche Caprice, so he was certainly well-versed in handling orchestral forces. Idylle de printemps—‘Spring Idyll’ (the manuscript also carries the variant title Une Idylle de printemps—‘A Spring Idyll’) is scored for woodwind, four horns, timpani, harp and strings. Unlike the other pieces mentioned, it seems to be Delius’s first attempt in a genre he would very much make his own: the orchestral impression or tone-poem inspired by nature or the seasons. Later examples, such as On Hearing the First Cuckoo in Spring, A Song of Summer and In a Summer Garden, constitute some of his most characteristic masterpieces. After an initial folk-like fragment on oboe and flute, a solo oboe gives out the lyrical main theme, which—like the whole work—affords plenty of evidence of how much the young composer was impressed by Grieg’s music. Indeed the clear scoring and cool harmonies of this ‘Spring Idyll’ suggest that Delius had a Norwegian spring among the fjords and mountains in mind. Though the work is short, it is notable that he manages to include several different episodes and incidents in it. The opening folk-like fragment becomes the basis of a brief quicker section with harp accompaniment, after which the music builds to a climax and subsides once again, with a hint of dance-rhythm, to a further exploration of the main theme, until the work comes to a contented close. Throughout, the mood is contemplative, taking delight in a sense of the natural world; and though in one sense Idylle de printemps is a derivative work, in another it contains many hints of the mature Delius. While the Idylle de printemps is an early and uncharacteristic work, Delius’s The March of Spring is a fully mature creation, in fact part of one of his greatest orchestral scores. Not often played as an independent work, it is actually the finale of his four-movement suite North Country Sketches. Composed in his French home at Grez-sur-Loing in 1913-14, and first performed by Sir Thomas Beecham at a London Symphony Orchestra concert in 1915, the sketches were inspired by the composer’s memories of roaming the woodlands and moors of his native Yorkshire, sometimes riding a pony, while he was still a boy. The succession of the four movements, which play without a break, give it something of the character of a highly compressed symphony; it is also a portrait of the seasons, the first movement dealing with Autumn and the second being entitled ‘Winter Landscape’. Both of these movements are characterized by languishing, downward-tending melodic lines and harmonies, but after the mazurka-like ‘Dance’ that forms the third movement, The March of Spring strides forth as a vigorous and hopeful finale. For Delius, the recurrence of Nature in the turn of the seasons was the force that he believed in with almost religious intensity (the evocation of the return of Spring would be the final revelation in his wartime Requiem). Delius’s original title for the movement was ‘Spring’s Awakening’, and he also gave the March a subtitle: ‘Woodlands, Meadows and Silent Moors’. The meadows are evidently illustrated in the evocative oboe arabesques of one of the early episodes. Though a march-rhythm comes and goes through the piece the impression is more like an ecstatic, onward-moving nature meditation with sudden bursts of energy and continual touches of vivid and imaginative scoring. The figuration in the strings seems to be fading into mystic evanescence when the music finally rises to a climax in the style of a defiant, full-hearted marching song, and then moves to a serene close. The symphonic poem that evokes the land, the force of nature and the turning of the seasons is almost an established genre—call it the ‘pastoral impression’—within British music. One of the masterworks of this entire genre is Enter Spring, which Frank Bridge composed in 1926-27 for the Norwich Triennial Festival: he conducted the first performance in Norwich on 27 October 1927. Unlike the typical ‘pastoral impression’, it proved to be a work in which the lyrical, ruminative aspects were subordinated to music of bracing vigour. Among the audience was the 14-year-old Benjamin Britten, who remembered it as a formative experience of his life: he was ‘knocked sideways’ by a ‘riot of colour and harmony’ and immediately sought to become Bridge’s composition pupil. Yet the piece received generally dismissive reviews and was heard only a few times more up to 1932. It then shared in the general neglect that overtook Bridge’s works well before his death, and remained unplayed for another 35 years until Britten himself revived it at the 1967 Aldeburgh Festival. It was the general resurgence of interest in Bridge’s works in the 1970s—in their own right, and not simply as the music of Britten’s teacher—which finally brought Enter Spring recognition as one of the outstanding British orchestral scores of the inter-war period. In the early 1920s Bridge had entered a new and intensely challenging stylistic phase, producing deeply troubled, even tragic works whose harmonic and textural complexity and high degree of dissonance disconcerted most contemporary critics. As his music became increasingly more individual and powerful, therefore, he found himself increasingly isolated and written off by the British musical establishment. The commission for Enter Spring—the only commission for an orchestral work he ever received—was thus one of the rare occasions in the inter-war period when Bridge received public encouragement, and he fell to the task with zest. In January 1927, however, having completed the short score, he broke off work to compose another ‘nature-poem’: the miniature for small orchestra There is a Willow Grows Aslant a Brook—an eerie, elegiac piece inspired by lines from Shakespeare’s Hamlet. Perhaps by so doing he was able for once to compartmentalize the darker, more introspective side of his musical identity. For Enter Spring is that other work’s antithesis—an expansive, confident outpouring of energy, which deploys all the hard-won skills of Bridge’s later manner in a full-hearted paean to the most hopeful time of the year, and to what Dylan Thomas was later to call ‘the force that through the green fuse drives the flower’. 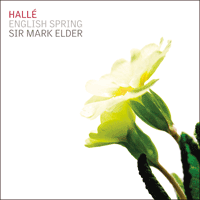 Enter Spring is subtitled a ‘Rhapsody’, but its structure is as taut a transformation of sonata form as any of the Brahms rhapsodies for piano—which may even have been in Bridge’s mind. Partly inspired by walks on the Sussex Downs where, a few years before, Havergal Brian had evolved his Gothic Symphony, Enter Spring opens with an introductory rush of glinting, wintry sounds, tossed hither and yonder by the winds, taking time to approach the work’s home key of D. Then March comes in like a lion: the principal Allegro moderato music, assembling itself from a wealth of interrelated figures in fluid and agile competition with each other, has a blustery, stormy excitement and energy all the greater for Bridge’s evident relish to be handling a large orchestra with the utmost bravura. The texture is very busy, highly contrapuntal, full of exhilarating percussion writing and fanfare-figures. Bridge’s thought is at its most impressive in the way he drives several subjects together, building exultant paragraphs of astonishing breadth, swift and surprising in their kaleidoscopic transitions between full orchestra and a few solo instruments. After a more relaxed, impressionistic span that does duty for a ‘second subject’, the music launches into a vigorous development, soaring through ever more strenuous climaxes until it is suddenly cut off short. A new Andante tranquillo episode opens in utter contrast, seemingly sunk in some slumberous pastoral dream. Untroubled birdsong sounds in the woodwind, and over a calmly rocking figure in the strings there unfolds a serene folksong-like violin melody in C sharp. Essentially diatonic, in contrast to the often involved chromaticism of previous events, the tune brings to the fore the stately jig-like measure which underlies the entire work. This superb theme spreads through the orchestra, becoming more and more singing (cantando) in character, while the ‘rocking’ accompaniment figure begins to sound like a pealing of bells. The music builds to a sun-drenched climax; then it dies away, and the main Allegro material steals in for a compressed and much-varied recapitulation which soon sees Bridge pushing the orchestra to an even greater peak of virtuosity. Once again a climactic passage is cut short, and then a jubilant coda is begun by bassoon and horns. The singing melody returns to crown the entire work in a burnished blaze of D major; the pealing bells have the triumphant final word. «Avec Spring Fire, j’ai tenté de décrire la première poussée, le premier élan du printemps dans les bois», écrivit Bax. Symphonie évocatrice et «librement travaillée» en cinq mouvements, composée pour grand orchestre en 1913, cet ouvrage s’inspire du premier choeur du poème païen de Swinburne Atalanta in Calydon (1865). La musique se prête à une lecture langoureuse, mais toutefois pas aux dépens de l’élan qui anime la structure globale. L’univers sonore est caractéristique de Bax par son alliage de chromatisme luxuriant, d’amples mélodies et d’éclatantes sonorités orchestrales apprises des nationalistes russes ainsi que de Richard Strauss et Debussy. Comme le suggère le titre du mouvement initial, In the Forest before Dawn (Dans la forêt avant l’aube), Bax se propose d’évoquer «l’heure incertaine et songeuse qui précède immédiatement le lever du jour dans les bois. Il a plu. Des gouttes tombent lentement des branches et un parfum humide et délicat s’élève de la terre.» Evoquant des forêts primitives—monde païen profondément significatif pour Bax—, un cor et un violoncelle chatoyants introduisent l’aube tandis qu’une frêle flûte, puis un hautbois et une harpe tremblante dépeignent les petites gouttes d’eau qui continuent de tomber. Les cordes énoncent une longue mélodie aux accents mélancoliques, tandis que la couleur instrumentale est enrichie par un motif de piano ondoyant et un thème de clarinette dansant. Avec un crescendo et des fanfares de flûtes exaltées évoquant le lever du soleil, le second mouvement (qui est en fait la deuxième partie de l’introduction) mène tout droit à l’exubérant Full day (Plein jour), dont la durée excède celle des deux premiers mouvements réunis. La partition contient une citation d’Atalanta in Calydon: «Viens avec tes arcs tendus et en vidant tes carquois, parfaite jeune femme, dame de lumière, Avec un bruit de vent et des fleuves de mai, Avec la clameur des eaux et dans ta puissance.» Ce mouvement terrestre aux opulentes textures comprend un passage contrasté pour quatre violons (marqué teneramente, ou tendrement) avec une mélodie que Bax utilisa plus tard dans l’ouverture de sa pièce pour piano Apple Blossom Time. La journée s’écoule, non sans péripéties, et mène doucement, à nouveau sans interruption, au quatrième tableau d’une lenteur envoûtante, Woodland love (Amour sylvestre, sous-titré Romance et décrit comme «une aquarelle nostalgique»). Joué à un tempo deux fois moins rapide que celui de Full day, il commence par une mélodie «romantique et lumineuse» et se poursuit «d’un air somnolent». «Car les pluies et les ruines de l’hiver sont terminées. Et toute la saison des neiges et des péchés, Les jours qui séparent ceux qui s’aiment, La lumière qui renonce, la nuit qui l’emporte. … Un pétale de fleur après l’autre, le printemps commence,» écrit Swinburne. Ici, dans Woodland love, des solos instrumentaux évocateurs font intervenir un violon seul, auquel font plus ou moins écho une flûte espiègle et une clarinette affirmée, luxuriante, ainsi qu’un hautbois piquant, tandis que les harpes et le piano complexifient la texture. Woodland love s’efface «dans quelque étrange harmonie, comme si les amants de la forêt s’étaient enivrés de leur propre extase onirique», au son des bois, puis des trompettes et des cors, qui tissent un dessin aux coloris délavés au-dessus d’accords des cordes graves et d’arpèges ondulants de la harpe. Cette brève pièce orchestrale fait partie des premières compositions de Delius, et demeura oubliée et inédite pendant de longues années après sa mort. La partition autographe fut longtemps en possession de Sir Thomas Beecham et son exécution ne devint possible que dans les années 1990. La plupart des œuvres orchestrales composées par Delius entre vingt et trente ans ne furent pas données de son vivant. Ce fut pour lui une période difficile, où sa détermination à devenir compositeur était en butte à l’opposition de ses parents. Ce fut aussi une époque où il voyagea beaucoup, en partie pour l’entreprise de laine familiale et en partie pour des déplacements personnels. Il visita la Norvège (où il se lia d’amitié avec Grieg) et la Suède, géra une orangeraie en Floride (où il étudia avec un professeur de musique local), enseigna la musique dans une université de Virginie, vécut pendant quelque temps à New York et enfin réussit à suivre des cours en Allemagne, au Conservatoire de Leipzig. En 1888, Grieg intervint personnellement auprès du père de Delius pour qu’il l’autorise à poursuivre une carrière de compositeur, et Delius se fixa en France, où il allait passer la majeure partie du reste de sa vie. C’est là, soit dans sa première résidence de Ville d’Avray, soit dans la seconde, à Croissy-sur-Seine, où il emménagea en 1889, que son Idylle de printemps, qu’il sous-titra «Morceau symphonique», fut composée. Bien qu’il s’agisse d’une œuvre de jeunesse, Delius avait déjà produit une partition substantielle et bien tournée, sa Florida Suite, composée en 1887 et donnée à Leipzig (devant seulement deux spectateurs!) pendant sa dernière année d’études, en 1888. Il avait également écrit plusieurs autres pièces orchestrales comme la Sérénade pour violon et orchestre, Sleigh Ride et la Marche Caprice, aussi avait-il une certaine expérience en matière d’écriture pour orchestre. L’Idylle de printemps—le manuscrit porte également le titre alternatif «Une Idylle de Printemps»—est écrite pour bois, quatre cors, timbales, harpe et cordes. Contrairement aux autres morceaux déjà cités, elle semble être le premier essai de Delius dans un genre qu’il allait s’approprier pleinement: l’impression orchestrale, ou le poème symphonique inspiré par la nature ou les saisons. Des ouvrages ultérieurs comme On Hearing the First Cuckoo in Spring, A Song of Summer et In a Summer Garden, constituent certains de ses chefs-d’œuvre les plus caractéristiques. Après un arrangement initial pour hautbois et flûte aux accents populaires, un hautbois soliste énonce le thème principal lyrique qui, comme l’ensemble du morceau, illustre au plus haut point combien le jeune compositeur était impressionné par la musique de Grieg. De fait, l’orchestration limpide et les fraîches harmonies de cette idylle de printemps donnent à penser que Delius avait en tête un printemps norvégien parmi les fjords et les montagnes. En dépit de la brièveté du morceau, il est remarquable qu’il parvienne à y inclure plusieurs épisodes et incidents différents. Le fragment initial populaire devient l’assise d’une brève section plus rapide avec accompagnement de harpe, après quoi la musique s’élève vers un apogée et reflue à nouveau, avec un soupçon de rythme de danse, vers une nouvelle exploration du thème principal, jusqu’à une conclusion satisfaite. Tout le long de l’ouvrage, l’atmosphère est contemplative, et le monde naturel y est un sujet de réjouissance ; et bien qu’en un sens, Idylle de printemps ne soit pas une œuvre grandement originale, elle annonce par nombre de ses aspects ce qu’allait être le Delius de la maturité. Si l’Idylle de printemps est une œuvre de jeunesse assez peu personnelle, The March of Spring de Delius est une création de la pleine maturité, l’une de ses plus belles partitions orchestrales. Il s’agit en fait du finale rarement joué isolément de sa suite en quatre mouvements North Country Sketches. Composées dans sa résidence française de Grez-sur-Loing en 1913-14, et créées par Sir Thomas Beecham en 1915 dans le cadre d’un concert de l’Orchestre symphonique de Londres, ces «Esquisses du Nord» furent inspirées au compositeur par ses souvenirs de promenades dans les bois et les landes de son Yorkshire natal, parfois à dos de poney, quand il était encore petit garçon. La succession des quatre mouvements, joués sans interruption, leur donne un peu le caractère d’une symphonie extrêmement condensée; c’est aussi un portrait des saisons; le premier mouvement dépeint l’automne et le second s’intitule ‘Winter Landscape’ (Paysage d’hiver). Les deux mouvements se caractérisent par des lignes mélodiques et des harmonies alanguies et descendantes, mais après la «Danse» apparentée à une mazurka qui constitue le troisième mouvement, The March of Spring s’élance, finale vigoureux et plein d’espoir. La récurrence de la Nature dans le défilé des saisons était la force en laquelle Delius croyait avec une ferveur presque religieuse (l’évocation du retour du printemps allait être la révélation finale de son Requiem du temps de guerre). Le titre d’abord prévu par Delius pour le mouvement était ‘Spring’s Awakening’ (L’éveil du printemps), et il donna également à la Marche le sous-titre: ‘Woodlands, Meadows and Silent Moors’ (Bois, prairies et landes silencieuses). Les prairies sont manifestement illustrées par les arabesques évocatrices du hautbois des premiers épisodes. Malgré le va-et-vient d’un rythme de marche au long du morceau, l’impression donnée est plutôt celle d’une méditation ravie et volontariste, avec de soudains éclats d’énergie et de continuelles trouvailles d’orchestration aussi marquantes qu’imaginatives. Les dessins des cordes semblent se dissiper dans une évanescence mystique lorsque la musique atteint enfin un apogée dans le style d’une marche chantée crânement et à pleins poumons, puis parvient à une sereine conclusion. Le poème symphonique qui évoque la terre, la force de la nature et le changement des saisons est presque un genre établi—appelons-le «impression pastorale»—dans la musique britannique. L’un des chefs-d’œuvre en la matière est Enter Spring, que Frank Bridge composa en 1926-27 pour le Festival triennal de Norwich. Il en dirigea lui-même la création sur place le 27 octobre 1927. Contrairement à l’ «impression pastorale» type, celle-ci se révéla être un morceau dont les aspects lyriques et méditatifs étaient subordonnés à une musique d’une vigueur électrisante. Parmi le public se trouvait un Benjamin Britten de 14 ans, qui l’évoqua ensuite comme l’expérience formatrice de sa vie: il fut «franchement épaté» par «une débauche de couleurs et d’harmonies» et chercha aussitôt à suivre les cours de composition de Bridge. Pourtant, l’ouvrage fut dans l’ensemble rejeté par la critique, et ne fut repris qu’à de rares occasions jusqu’en 1932; ensuite, il se trouva aussi oublié que les autres œuvres de Bridge, et ce bien avant la disparition du compositeur, et ne fut pas joué pendant encore 35 ans avant que Britten lui-même ne le reprenne lors de l’édition 1967 du Festival d’Aldeburgh. C’est le regain d’intérêt pour les œuvres de Bridge des années 1970—pour leur propre valeur, et pas simplement parce qu’elles étaient signées par le professeur de composition de Britten—qui finit par faire enfin reconnaître Enter Spring comme l’une des plus grandes partitions orchestrales britanniques de l’entre-deux-guerres. Au début des années 1920, Bridge avait abordé une nouvelle étape stylistique intensément stimulante, produisant des œuvres torturées, voire tragiques, dont la complexité harmonique et texturale et les nombreuses dissonances déconcertèrent la plupart des critiques de son époque. A mesure que sa musique se faisait de plus en plus personnelle et puissante, lui-même se trouvait de plus en plus isolé et ostracisé par l’establishment musical britannique. La commande concernant Enter Spring—la seule qui lui ait jamais été faite pour une pièce orchestrale—fut ainsi l’une des rares occasions où il connut un encouragement public pendant l’entre-deux-guerres, et il se mit à la tâche avec célérité. En janvier 1927, toutefois, ayant achevé la particelle, il interrompit son travail pour composer un autre «poème sur la nature»: la miniature pour petit orchestre There is a Willow Grows Aslant a Brook—pièce inquiétante et élégiaque inspirée par des vers du Hamlet de Shakespeare. Peut-être que ce fut pour lui le moyen de compartimenter le versant plus sombre et introspectif de son identité musicale. Car Enter Spring est l’antithèse de ce second ouvrage: un débordement d’énergie expansif et assuré qui déploie toutes les capacités chèrement acquises du Bridge de la maturité en un généreux dithyrambe à la période la plus optimiste de l’année, et à ce que Dylan Thomas appellerait plutôt «la force qui pousse la fleur à travers la verte tige». Le sous-titre de Enter Spring est «Rhapsody», mais sa structure correspond aux transformations tendues de la forme sonate que l’on trouve dans bien des rhapsodies pour piano de Brahms—que Bridge avait peut-être en tête en composant. Inspiré en partie par des promenades dans cette même région des Sussex Downs où quelques années auparavant, Havergal Brian avait conçu sa Symphonie gothique, Enter Spring débute par une avalanche de sons miroitants et hivernaux, lancés aux quatre vents et prenant tout leur temps pour approcher la tonalité fondamentale de ré majeur. Puis mars entre comme un lion: l’Allegro moderato principal, assemblé à partir d’une pléiade de dessins interdépendants qui s’affrontent en une joute fluide et agile, présente une exaltation orageuse et une énergie rendue d’autant plus forte par le plaisir manifeste que prend Bridge au maniement virtuose d’un grand orchestre. La texture est très affairée et contrapuntique, débordant d’une exaltante écriture pour percussions et de figures de fanfare. La pensée de Bridge est particulièrement impressionnante dans sa manière de mener plusieurs sujets de front, édifiant des paragraphes jubilants d’une beauté renversante, lestes et étonnants dans leurs transitions kaléidoscopiques de l’orchestre complet à quelques instruments solistes. Après un passage impressionniste plus détendu faisant office de «second sujet», la musique se lance dans un vigoureux développement, s’élevant vers des sommets toujours plus énergiques jusqu’à une soudaine interruption. Un nouvel épisode Andante tranquillo apporte un contraste complet, apparemment plongé dans la somnolence d’un rêve pastoral. Des chants d’oiseau résonnent imperturbablement aux bois, et au-dessus d’un paisible dessin berceur des cordes se déploie une mélodie de violon sereine aux accents populaires, en ut dièse. Principalement diatonique, contrastant avec le chromatisme souvent compliqué de ce qui précède, la mélodie souligne la mesure élégante, apparentée à une gigue, qui sous-tend l’ensemble de l’ouvrage. Ce superbe thème se communique à tout l’orchestre, son caractère se faisant de plus en plus chantant (cantando), tandis que le dessin d’accompagnement «berceur» commence à ressembler à des sons de cloches. La musique atteint un apogée gorgé de soleil puis se dissipe, et le matériau initial Allegro s’insinue pour une récapitulation condensée et très variée qui voit bientôt Bridge pousser l’orchestre vers de nouveaux sommets de virtuosité. Une fois encore, un apogée est brisé net, puis une coda jubilante commence au basson et aux cors. Bientôt, la mélodie diatonique chantante revient couronner l’ensemble de l’ouvrage dans un ré majeur lustré et c’est le carillon triomphal des cloches qui a le dernier mot.